People die at the fair. 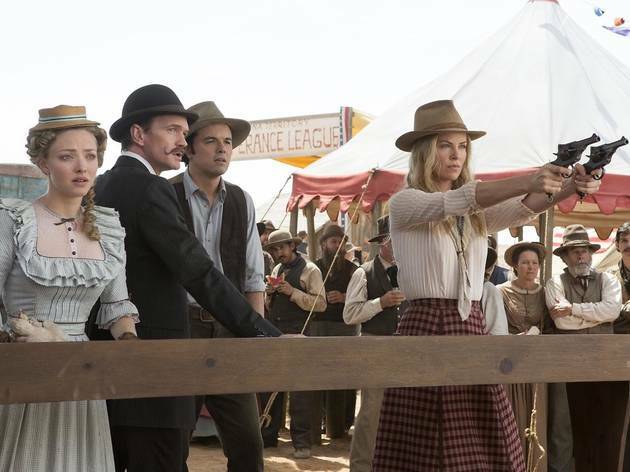 That’s the sad, sobering reality for nebbish sheep farmer Albert Stark (Seth MacFarlane), a man out of time in the perilous Old West. There’s outlandish danger lurking around every frontier bend, and the long-running gag of A Million Ways shows us some of the silliest, most grotesque manners in which a cowboy could perish. In case you didn’t know, “decapitated by falling block of ice” is not something you want on your tombstone. 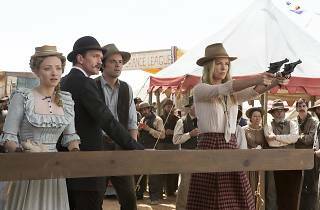 The plot doesn’t pioneer into virgin territory: Albert overcomes a breakup with the help of a mysterious new woman in town (Charlize Theron), who happens to be married to the region’s most notorious bandit (Liam Neeson). There’s the requisite saloon fight, the peyote-induced moment of epiphany with fun-loving Native Americans and, of course, a gun-slinging duel at high noon—three of them, in fact. It’s a full-on MacFarlane production (he cowrote and directed), so the toilet jokes and f-bombs flow as freely as the whiskey.